So, they assassinated another one yesterday. A general, Francois El-Hajj by name, not known in Europe but a senior officer and the chief of the Lebanese general army staff, whose battle for the Nahr el-Bared Palestinian refugee camps earlier this year made him an obvious target for the Syrians, for the Iranians, for the Palestinians, for just about anyone else you care to note. Although he was an obvious target, the implications for the current army chief and possible future president – General Michel Suleiman – were devastating. 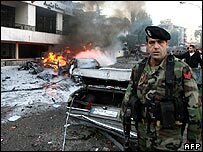 The Lebanese army’s chief of operations, General Francois al-Hajj, has been killed in a bomb attack. Three other people also died in the blast in the Christian town of Baabda, close to the presidential palace, on the outskirts of the capital Beirut. Gen Hajj had been tipped to become army chief if Gen Michel Suleiman is made president to remedy a political crisis. Parliament has failed to elect a president and the opposition refuses to recognise the elected government. Since Israel’s July 2006 war on Lebanon, and up to the current deadlock over electing Lebanon’s next president, the Bush administration has gone out of its way to express its commitment to Lebanese “democracy” and to building a strong and sovereign country that can “stand up” to Syria’s and Iran’s allies within Lebanon’s borders. Inside those borders, prime minister Fouad Siniora’s March 14 government and the Hizballah-led opposition are sharply split over Washington’s intentions. The March 14 movement has feverishly called on the capital of the “free world” for help and the movement’s civil-war seasoned leaders reassure the Lebanese that the superpower won’t abandon their “cedar revolution.” In response, opposition leaders reiterate their distrust of Israel’s closest ally and accuse its March 14 supporters of holding Lebanon hostage to its enemy’s best friend. In the fog of these accusations and counter-accusations, is it possible to evaluate Washington’s support to Lebanon without resorting to the polemics of either camp? The true measure of the alliance of any two states or political groups rests on an accurate and fair reading of two forms of support: military aid and economic assistance, and reaching a verdict about these two forms of support is based on the examination of three properties of such aid: the monetary value (size or quantity) of this aid, the declared and hidden objectives of the aid and the conditions attached to it (the quality of the aid). Based on these criteria, what is the truth behind the US support for Lebanon, in numbers and according to Washington’s own sources? One of the main bones of contention between the government and the opposition in Lebanon is the disarming of Hizballah. The March 14 movement does not miss an opportunity to proclaim its intention to build a strong state capable of protecting the country’s borders (particularly the south). And the disarming of Hizballah, the Hariri-led movement claims, is a major step in that direction. So does American military aid provide a realistic alternative to Hizballah’s battle-proven power of deterrence? From 1946 to June 2006, Lebanon did not receive any significant US military aid except in the years 1981 to 1984. This was the period when the Lebanese army’s official leadership was aligned with forces sympathetic to or allied with Israel, and more importantly it was a period of direct American military intervention in Lebanon. During this period, Lebanon received $148 million in military aid, an average of $37 million per year. This aid surpassed what the country had received in the entire 34 years that preceded; around $128 million (95 percent of this aid was in the form of loans not grants). After 1984 and the partial withdrawal of Israeli troops from Lebanon, US military aid declined to its lowest levels (around half a million annually earmarked for training purposes). The assassination of former prime minister Rafiq Hariri, contrary to what some might think, did not lead to a fundamental change in this aid policy. The Bush administration’s request was for just one million dollars in 2006 and around $4 million for 2007. The gigantic increase came on the heels of the summer 2006 Israeli war on Lebanon. In the wake of the war, the Bush administration filed an emergency request to congress to provide Lebanon with additional military support valued at $220 million for the single year of 2007. What we learn from this is that any significant increase in US military aid to Lebanon is temporary and linked to the existence of internal divisions in Lebanon or the outbreak of regional wars or conflicts. And as such, this support is not the product of a strategic alliance akin to that forged between Hizballah and Iran. More importantly though, even when this aid is boosted, the objectives and conditions of its release are far from geared towards building a Lebanese military force capable of defending the sovereignty and territorial integrity of this tiny country. Protecting Lebanon according to the Bush administration is achieved by undermining its ability to fight Israel, the biggest source of threat to Lebanon’s security, and the entity which attempted to invade it in the same year those aid packages were pledged. Some might argue that America’s above-stated goal is meant to prevent any non-sate organization (Hizballah) from monopolizing the duty of defending Lebanon. But the conditions attached to the aid leaves no doubt that building any force, legitimate or otherwise, is impossible under constraints placed by the US. According to these conditions, any support to Lebanon’s army should be intended for “expanded personal training by private US contractors or provision of spare parts and ammunition for Lebanese forces,” as well as vehicles employed for logistical or patrol purposes. As for equipment and weapons normally used to defend any country’s territory, such as anti-aircraft missiles or tanks or even technologically primitive missiles such as Katyushas, such weapons are out of bounds according to the aid provisions. The administration calls it “non-lethal” assistance. In contrast, permitting Israel to invest a portion of US aid in domestic military research since 1977 was instrumental in the development of the Merkava tank, the primary weapon used for Israel’s land invasion of Lebanon last summer. Counting on US military aid means transforming the Lebanese army at best to a peacekeeping or patrolling force and at worst an internally oppressive security force. This suggests that the only way to disarm Hizballah without stripping the people of southern Lebanon of the only effective defense force on their land is for the Lebanese government to seek assistance from US adversaries, the same ones possibly Hizballah is allied with. The history and present trend of US economic aid to Lebanon mirrors to a great degree that of its military aid. Again, the turning point for an astronomical increase of the aid (much of it remains a pledge) was the 2006 Israeli war on Lebanon and not the assassination of Hariri. American economic aid to Lebanon was and remains part of neoliberal American policies across the globe that aim to construct an unregulated market-based economy by weakening the economic role of the very governments it purports to support. How can one explain the US policy towards Lebanon? First, Lebanon may be a “piece of the sky” according to its famous crooner Wadih Assafi, but in the eyes of US policy makers, it is a bargaining chip used to settle other regional conflicts. In fact, Lebanon does not possess any of the properties that constitute vital national interests to a superpower such as oil fields, international waterways or military bases. Hizballah may be the only serious threat. In recorded history, only two US presidents described Lebanon using the rhetoric of the “national interest” –(Eisenhower in 1958 and Reagan in 1983). And both references coincided with direct US military intervention in Lebanon and not in the vein of drawing up a strategic vision of Lebanon’s place in foreign policy. Secondly, The US does not trust two of three types of allies in the Middle East, the Siniora government among them. The first type is that of political forces or governments that represent elites or particular religious or political communities and who exercise limited authority within countries or territories that suffer from partial or total instability. These countries include Iraq, Palestine, Afghanistan and Lebanon. US military and economic aid to their allies in these countries is mostly symbolic, tactical or directed towards internal security and against the interest of the peoples or these countries. The second category of allies is composed of governments or dictatorial regimes that represent their own interests over and above that of their people and rule in countries that are partially or totally stable. These countries include Egypt, Jordan, and Saudi Arabia. US aid to this countries is more than symbolic, but often limited and subject to serious constraints. 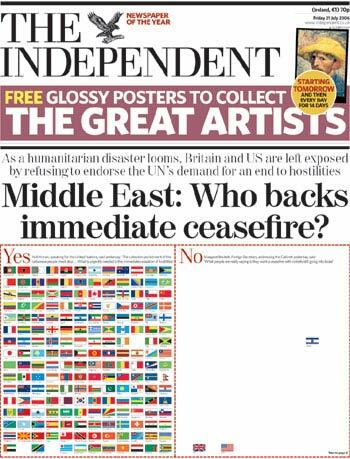 The last category of US allies in the Middle East is that of governments that speak in the name of the interest of its own people (at least the majority) and rule in internally stable countries. These countries include Turkey and Israel. US aid to these countries makes a significant contribution to the military and economic performance of these countries. Understanding US aid to Lebanon, and comparing it to similar patterns in Palestine and Iraq in light of this overall map of US aid to the region, leaves little doubt that Lebanese (and by extension Palestinian and Iraqi) politicians betting on the goodwill and unmatched power of Washington to build their country’s defenses, are doing so out of either unintentional or willful ignorance, and both are a recipe for further instability and a disregard for the safety and security of their people. Hicham Safieddine is a Lebanese Canadian journalist. This is an edited version of an article that appeared recently in Arabic in the Lebanese newspaper Al-Akhbar and is republished with permission. The worst threat ever faced by the Lebanese? Fatah Al-Islam the worst threat ever faced by the Lebanese? I hardly think so. Why is he making them such a big deal? To justify the senseless killing of at least 42 civilians (probably more), misery of thousands of refugees and destruction of a camp perhaps? You know a crime has taken place when exaggerated claims like this are used to justify the attack. Lebanese troops killed at least 222 Islamist militants in three months of fighting at a refugee camp in northern Lebanon, the defence minister says. Elias Murr said 202 militants from the Fatah al-Islam group were captured since fighting erupted in May. A number have been charged with murder and terrorist offences. The Lebanese army finally took control of Nahr al-Bared camp on Sunday. At least 160 soldiers died in Lebanon’s worst internal violence since 1990. At least 42 civilians were also killed in the fierce fighting, bringing the death toll to more than 400. On Monday, there was a brief eruption of gunfire and explosions near the eastern edge of Nahr al-Bared as army units patrolled through the camp in search for remnants of Fatah al-Islam. BADDAWI REFUGEE CAMP, Northern Lebanon, 13 August (IPS) – Palestinians displaced by the fighting at the northern Lebanese refugee camp Nahr al-Bared have accused the Lebanese army of torturing and abusing civilians. Fadi Wahbi, 36, told IPS that he was detained for questioning by the Lebanese army as he fled Nahr al-Bared with family members. He was held for two days at the nearby Kobbeh military base and then transported, along with other young and middle-aged men who fled the fighting, to what he believes was the Ministry of Defense in Beirut. There Wahbi’s long ordeal began. Prison officials accused him of belonging to Fatah al-Islam, and kept him blindfolded in a crowded prison cell for eight days with scores of others similarly accused. When he insisted on his innocence, they began to beat him. “Every time I said that I was not lying, they struck a blow,” he recalled. “I did not know where the blows were coming from. I spent most of the eight days blindfolded and without sleep.” Prison authorities also tortured Wahbi, twisting his extremities almost to the point where he lost consciousness. Later he said he was forced to stand in excruciating positions for days. Dozens of Palestinians were kept in a single room, without space to sleep and unable to communicate with each other. He was eventually sent back to Kobbeh in northern Lebanon, and managed to reach a nearby hospital after his release. Wahbi’s story mirrors the testimonies of dozens of Palestinians, most of whom are too terrified to speak on the record. Milad Salameh, a nurse at the Shifa’ Clinic in the Baddawi camp, says he has seen more than 30 cases of abuse at the army’s hands. The Shahed Palestinian Centre for Human Rights, based in Beirut, has documented over 50 cases of torture of Nahr al-Bared residents. Its director, Mahmoud al-Hanafi, told IPS that the army has systematically ignored human rights in its battle with Fatah al-Islam, and called upon both the army and Fatah al-Islam to respect the Fourth Geneva Convention, which governs the treatment of civilians during wartime. Fighting began in late May when Fatah al-Islam, which in the preceding months had established itself in Nahr al-Bared, opened fire on Lebanese security forces. The ensuing battle between the army and the militants has left hundreds dead, and many Palestinians accuse the army of attacking unarmed civilians. In one incident recounted by displaced locals in Baddawi, and documented by the Shahed centre, Nahr al-Bared resident Nayef Salah Saleh attempted to drive a van with 25 civilians out of the camp. Witnesses claim that army snipers shot and killed Saleh, causing the van to lose control and come to a stop. When Muntaha Abu Khalil, pregnant four months, opened the door she too fell in a storm of gunfire. The army then surrounded the van and detained many of its occupants, including three children. The children, including Amer Bahij Abdallah, 16, say they were then tortured. Abdallah recalled that “my face was covered with a black cloth, and I was punched, beaten and given electrical shocks to force me to give information about Fatah al-Islam.” He said he had nothing to do with the group. Others, like Ahmad Hazbour, a former Nahr al-Bared resident, claimed that they were beaten and verbally abused at checkpoints and then detained. “The camp was attacked because we are Palestinian,” said Nahr al-Bared resident Muhammad Naddwi, 23, echoing a sense of discrimination felt by many Palestinians here. The camps have often come under fire from various armies — the Lebanese army destroyed the Nabatiyeh camp in 1973, and many Nahr al-Bared residents are displaced refugees from the Tel al-Zaatar camp, which was destroyed by Christian forces in 1976. With their home destroyed and the memory of torture and abuse still fresh, many Palestinians from Nahr al-Bared are shaken and without hope.